North Cornwall continues to be a very popular buyer destination, with interested parties looking to relocate from many parts of the UK as well as those moving locally. With the market now stronger than in recent years, you may be considering the many options available regarding the successful sale of your property. We are the only estate agent with offices in Wadebridge, Padstow, Rock and Camelford providing an elite level of marketing coverage throughout this part of the county. We would be delighted to discuss with you, any property related enquiry so please don't hesitate to telephone or email us. Should you wish us to carry out a free market appraisal of your property, enter your details below and we will contact you to make an appointment. In the meantime, you may like to browse through recent articles below, some of which look at preparing your property for sale. To floor-plan or not to floor-plan – that is the question? Well, really there is not too much of a debate to be had when considering the above. Rightmove, one of the leading property portals, has surveyed potential buyers and house hunters and the results speak for themselves. The report concludes that 37% of potential buyers would be less likely to enquire about a property without a floor-plan. One in five said they would either ignore the property advert completely or only re-visit if nothing else caught their eye. Prospective purchasers are spoilt for choice when it comes to the array of possible property portals available to them. The data available can be presented in many different formats and can be overwhelming to the point of information overload. However, it should be remembered that with so much choice, your property only gets a very limited time to attract the attention of the viewer – so initially, simplicity is the key! Most portals have excellent search facilities, providing options where you can state location, price range etc., so you can narrow your search to what you are looking for. So, on our PC or mobile device, we are presented with a list of possible properties that meets our requirements. Good start! USP’s – unique selling points, eg., what makes the property stand out from the rest, along with good photographs, should be the first thing that prospective purchasers see. They are now interested enough to flick through the images – progress! Does the property have the basic criteria required, number of bedrooms, parking or garage, south facing garden? Yes? Great – we are in with a chance. Ok – so what is the layout of the property I’m already thinking about booking an appointment to view? Oh no – what’s this? There is a mile long passage of text for me to read…… Ok – floor plan first. Where is the floor plan? Oh no, there isn’t one! Can I be bothered to read all of this? Or shall I take a sneaky peek at the next property in my search first? Why not, I can always come back to this property when I have more time. But the question needs to be asked – will they? A floor plan can provide so much information to the prospective purchaser in such a short space of time, so if you are trying to attract an audience to your property, it should be strongly considered. With one in five potential purchasers not even willing to explore the attributes of your property without there being a floor plan available, answers the question. Also remember, with mobile access to property portals due to overtake fixed internet access by 2015, viewing property particulars on mobile devices, tablets and mobile phones, are much more user friendly when a floor-plan is available. So when your estate agent suggests that a floor-plan would be a good idea, don’t look at this as an un-necessary expense, but as part of your marketing package. To floor-plan – should be the answer. Sponsored by Rolls-Royce Motor Cars and Gaggenau, the UK Property Awards attracted entries from hundreds of companies across the length and breadth of the UK. Winning entrants were presented with either a ‘Highly Commended’ or ‘5-Star’ award. Cole Rayment & White won the 5-Star award for Best Real Estate Agency in Cornwall. Attending the UK Property Awards presentation ceremony with fellow partners Peter Olivey and Jason George, Jeff Cole said “We are particularly delighted to have been awarded the 5 Star Award for Best Real Estate Agency in Cornwall which we feel recognises the high degree of professionalism across all 4 of our branches in North Cornwall. We feel particularly proud to have won such a prestigious award which also acknowledges our hard working teams within all 4 offices who strive to deliver the highest levels of customer service in what is widely recognised as a very competitive and challenging industry”. Cole Rayment & White is the only Estate Agent with offices in Wadebridge, Rock, Padstow and Camelford providing first class marketing coverage throughout this most beautiful part of North Cornwall. 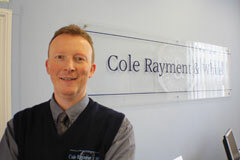 Cole Rayment & White are also members of The Guild of Professional Estate Agents which is a national network of over 750 independent estate agents. The Guild offers access to the lucrative London and international investor markets and boasts a unique National Property Centre in central London, making property details within their register available to thousands of potential buyers. The offices located in Padstow and Rock are delighted to have opened two Fine & Country branches and join over 275 other offices worldwide as well as the Fine & Country Property Centre based in Park Lane, London. The highest scoring 5-star winners at the UK Property Awards now go forward to represent the UK in the 2014-2015 International Property Awards. They will compete against other regional winners to find the ultimate World’s Best in each category. The results of the eagerly anticipated ‘World’s Best’ Property Awards will be revealed at a glittering awards presentation ceremony in Dubai on December 4th. Jason George, Peter Olivey & Jeff Cole at The UK Property Awards. Cole Rayment & White “in the pink” at successful London Property Exhibition. Cole Rayment & White, members of The Guild of Professional Estate Agents, recently held their Autumn Property Exhibition at the prestigious National Property Centre in Park Lane in London, partially dressed in pink! The Guild of Professional Estate Agents is a National Network of carefully selected Independent Estate Agents working together to ensure a professional service to the public and ensures that Guild Members and their staff are regularly trained and fully qualified in Estate Agency practice and customer service under The Guild Associate Scheme. The Guild's offices in Park Lane provide a unique National Property Centre delivering access to the lucrative London and international investor markets and by using state of the art touchscreen technology, properties are at the fingertips of thousands of potential buyers 24 hours a day, 7 days a week. 'Wear it Pink', is a charity event that aims to raise awareness and money for research into finding a cure for Breast Cancer and the Guild of Professional Estate Agents took part by arranging cake sales, games and pink fancy dress. The office windows were decorated with pink underwear and bunting, and a selection of pink cakes and champagne could be enjoyed for a small donation. Jeff Cole & Jason George at the National Property Centre in Park Lane, London. The Royal Marines WAGs (Wives And Girlfriends) Calendar has been as popular as ever for 2015! The calendar celebrates the 350th year of the Royal Marines in collaboration with the Royal Marines Charitable Trust Fund (RMCTF). With latest research by Direct Line noting that Cornwall is the most popular location in the UK for holiday homes, it was of no surprise that the Fine & Country Teams from the Cole Rayment & White offices experienced high levels of interest from potential buyers seeking a second home and/or investment opportunity, at their inaugural Mayfair property exhibition. The estate agent also had enquiries from commuters wishing to move to Cornwall permanently, seeking the lifestyle that the West Country has to offer and escapism from the hustle and bustle of City life. The event was hosted at Fine & Country’s prestigious Park Lane showrooms in London on the 17th and 18th April, providing their sellers in and around Rock, Padstow and the Camel Estuary, access to the lucrative London and International investor markets. Jeff Cole from Fine & Country comments: "With its 300-mile coastline and recent excellent weather, it is no wonder that Cornwall continues to attract families wanting to go on holiday in the UK, rather than pay the vast expense of going overseas. Holiday Lettings is a booming industry down here for that reason and so second home owners are looking to tap into that market." "Rock, Daymer Bay and Polzeath are the most sought after locations round here with London buyers, due to house price growth and rental returns. During the 8 weeks of the summer season for example, owners of good quality holiday homes can expect to earn upwards of £2,500 a week for anything within walking distance of the beaches, and anything with a sea view can command upwards of £1,500 a week. Even during the winter months, these properties can earn £500-£800 per week. Properties here rarely appear on the market, especially the front line ones, so when they do they are snapped up. If priced correctly they usually achieve guide price, if not more." "For those looking to move to North Cornwall permanently, locations such as Wadebridge and the surrounding villages are extremely popular. They’re still close to the beaches and sailing facilities of the likes of Rock and Polzeath, but they offer the joys of traditional Cornish life away from the tourist crowds, and properties are much more affordable. For example, a spacious four bedroom country cottage surrounded by countryside views can range from £350,000 to £500,000, offering an idyllic retreat for a London family or those looking to downsize from elsewhere in the UK. "Our London property exhibitions offer our local vendors unique access to those buyers at one of the most prestigious locations in the world, so I am delighted that our latest exhibit was a success. I look forward to the next one!" Fine & Country and Cole Rayment & White through the Guild of Professional Estate Agents, are part of a Global Network of carefully chosen independent estate agents, which allows them to promote their clients’ properties to the widest possible audience. Combined with strong marketing and PR services, the company is best placed to promote property across the UK, including key media such as Sunday Times, Telegraph and Evening Standard. Jeff Cole, from Cole Rayment & White explains how changes announced in the summer Budget could impact the sales and lettings markets in and around Wadebridge, Rock and Padstow. "On 8th July, Chancellor George Osborne delivered his summer Budget, the first solely Conservative spending plan for almost 19 years. Mr Osborne echoed the Conservatives election pledges last month to tackle the UK’s housing shortage and aid first time buyers onto the housing market, before announcing three major changes to the property market aimed at changing the unpopular inheritance tax thresholds and creating a more balanced playing field for homeowners and Buy to Let investors." From 2017 there will be an extra £175,000 per individual allowance on top of the current £325,000, which means that if a couple own a property up to the value of £1million, they will be able to leave it to their children or grandchildren free from this death duty. Downsizers will also be eligible. If somebody downsizes before they die, their tax-free exemption will stay at the value of the house that they sold. The Bank of England believes the current system poses a risk to the country's balance of homeownership and properties to rent as homeowners are not able to claim tax relief like landlords can. At the moment, Buy to Let investors may buy a property to let it out and then deduct mortgage interest payments from any rental income they receive, depending on their income tax rate. This means that if a landlord is a higher-rate taxpayer they are able to get 40% tax relief on the mortgage interest they are paying. Mr Osborne has now announced that this relief will be restricted to 20%, the basic rate of income, no matter what tax level somebody is on, which will be phased in over a period of four years from 2017. The amount householders can earn by renting out a furnished room will be increased from £4,250 to £7,500 per annum tax-free. "This is going to be music to the ears of many home owners in North Cornwall. There's been a lot of pressure on Mr. Osborne to change this death duty with 59% of voters believing the tax is unfair (YouGov – March). It was initially designed to be paid by the wealthy, but with house prices appreciating, particularly where we are, 'ordinary families' are now paying it, in addition to other taxes such as Stamp Duty. A family's wealth can now be passed to their loved ones rather than the Government, whom are most likely struggling to upgrade their home or even get onto the property ladder. This new threshold should give them a better chance to put together the deposit required for a new home." "We should also see more larger homes come to market as under the new system, homeowners are able to downsize and still benefit from the IHT changes. This is great news and is seen as an attempt to encourage pensioners to free up larger properties for growing families." "There was a lot of speculation that tax perks for Buy to Let borrowers would be ended, so this came as no surprise, but it is going to be disappointing for both landlords and tenants. 15% of new mortgages are Buy to Let and this is a fast paced market so the impact of these changes should not be underestimated, despite being phased in over a period of four years. Investors might become discouraged from entering the sector or adding to their portfolios, which could mean a decline in the number of available properties to rent. This is not good news for tenants as everybody knows that low supply and high demand leads to an increase in prices, in this case rental values!" "However, should Buy to Let borrowers start to place their money elsewhere, it could present an opportunity for both first and second time buyers. At the moment these buyers are having to compete with investors, often losing out to them as competitive interest pushes the guide price out of the reach of their budgets. With other Government initiatives confirmed in the Conservative’s Housing Manifesto, first and second time buyers could fill this gap." "According to the flat and house share site SpareRoom.co.uk, there are an estimated 19 million empty bedrooms in owner-occupied properties in England alone. Freeing up just 5% of those rooms would accommodate almost a million people – the equivalent of a city the size of Birmingham! That is an incredible figure so this scheme is a great way to make better use of existing stock and should help millions of renters and homeowners." Whilst driving to work this morning I saw a barn conversion with the roof and gutters covered in leaves as is extremely common at this time of year. A few simple tasks can be undertaken to prevent dampness and further deterioration to a building whether you are preparing your property for sale or just simply for your own peace of mind. Many of these works are easy to organise and inexpensive, yet can prevent much more serious problems if not attended to. With any building, particularly in the winter, it is important to make sure that it is kept as dry as possible. Clearing leaves and debris from gutters, downpipes and drainage gullies should be undertaken and subsequently checked to ensure that they are not leaking. This is best done during a heavy rain shower to pinpoint the cause of any leak. Look for stains running down the building which is normally a “telltale” sign of a leaking gutter and of course check for any cracks or flaking paintwork in your render and windows. It is worthwhile inspecting roofing slates to see if any are chipped or have slipped, together with flashings around chimneys, and any mineralised felt flat roofs including those on outbuildings and sheds. I recently noticed that the felt had perished on my own shed, despite not showing any signs of leaking internally and a relatively simple repair of replacing the felt will prevent any more serious damage to the timber of the shed and of course the contents. A particular pet hate of mine is ivy on a building which can cause tremendous damage and my advice would be complete removal although sometimes this can be quite difficult depending on how long it has been there. If this is the case, cut it off near the ground and remove it once it has died off. Ivy can cause trouble to pointing, rendering and roofing if it is allowed to grow unabated. It is also worth repairing any loose pointing as again, a relatively simple repair can prevent a much more serious problem if dealt with early. Trees are another issue and large trees should be kept away from your building and drainage points as roots can cause damage to driveways, footings and the structure of the property. Finally, depending upon ground conditions surrounding your home, it is always worth clearing and tidying any weeds and making sure that water can run away from the base of your walls and drain into the garden rather than into your property. Cole Rayment & White selected for awards as best Cornwall estate agent for two years running, and best South West agent for marketing property. Jeff Cole, Director of Cole Rayment & White is delighted to announce that the company has won two awards at the prestigious International Property Awards 2015-2016, winning either Five Star or Highly Commended in the Real Estate Agency category for Cornwall for the second year running, and the Real Estate Agency Marketing category for South West England. Having been in operation for 26 years, Cole Rayment & White has built an excellent reputation in the North Cornwall region, and has once again demonstrated its commitment to delivering distinctive sales and marketing campaigns which include the innovative use of tailored marketing tools and approach to lifestyle marketing. The level of the awards Cole Rayment and White has won (either highly commended or 5-star) will be revealed when the official announcements are made at a gala presentation dinner at the London Marriott Hotel Grosvenor Square in Mayfair on the evening of Friday, October 9th. The International Property Awards is now in its 20th year and billed as being the property industry's most prestigious awards programme. Jeff Cole commented; “We are very proud to be the Cornwall winners for the second year in a row, and honoured to have our marketing strategy recognised as industry leading for the South West too. We believe it’s important to reflect the lifestyle of each home we are selling as well as the bricks and mortar, and we do so by producing high quality marketing materials to ensure sophisticated presentation. "We also understand that widespread exposure of our properties for sale is crucial, especially as so many London and South East buyers are either purchasing a second home down here or moving this way permanently. So this year, we employed a PR consultant to target that audience to ensure we regularly appear in newspapers such as Sunday Times, Evening Standard and The Guardian. Combine this with our local expertise and our reputation for approachability and helpfulness, we are best placed to enhance the appeal of our homes, attract competitive interest and achieve the best price for our clients." As regional winners, the company is now in the running to represent the United Kingdom in the final stage of the competition later this year. If it has attained the highest score in the real estate agent category, Cole Rayment & White will compete against other winning companies from Asia Pacific, Africa, Canada, the USA, Central and South America, the Caribbean, Arabia and Europe for the coveted crown of World’s Best Real Estate Agent. The award is a major achievement for Cole Rayment & White as entrants are judged against a strict set of criteria. Judging was undertaken by a panel of over 70 experts from all over the world and chaired by two active members of the House of Lords: Lord Caithness and Lord Best. Stuart Shield, president of the International Property Awards, commented, "I’m delighted that the UK’s real estate agents, property consultants and lettings agencies have demonstrated such an extensive range of exemplary services, they have also embraced the latest in new technology and managed to achieve the extremely high levels of customer support that is vital to succeed in this competition." Does your land have lucrative development potential? At Cole Rayment & White we know a thing or two about land and development consultancy. If you have a large garden or own land which could form a ‘land assembly’ along with your neighbours our expertise is on hand to advise you about its potential for development. The same applies if you own commercial premises or strategic land on the edge of settlement. Or perhaps it’s a site with planning history. The good news is there are many options open to you – and our land experts can help you maximise the value of your asset. It’s a question we’re asked frequently. When it comes to value, the best returns are typically achieved by obtaining planning permission to develop on land. Getting planning permission and approval can be challenging to achieve and it often requires experience, technical knowledge and a great deal of tenacity. This is just one of the areas where we can help. If you’re selling land, you’re in the driving seat. You can choose the route which is most suited to you, and we can support you with advice to apply for planning yourself, or alternatively we could guide you through the process of selling to a house builder or developer. It’s worth bearing in mind there are further valuable options if you choose this route and we can suggest the best one to suit your needs and expectations. We work with house builders, planning consultants, architects and developers across North Cornwall and can help you achieve the very best price within your timescales. To find out more about intricacies of selling land and how we can help please don’t hesitate to contact us for a chat. "The staff were extremely helpful at every stage of our quite long process!" "A professional estate agent ....... Polite, friendly, responsive. Thank you for keeping us informed and easing the journey"
"Excellent - beyond call of duty. Very helpful indeed! Friendly, professional and courteous"
"Excellent Staff - very friendly, courteous and attentive at all times"
"I have had dealings with most local Estate Agents and CRW and far and away the most professional"
"Exceptional! You know what you do and you keep on going!" "Nothing is too much trouble and being 250 miles away, it was much appreciated"
"Each time we called ....You were all very much on the ball and reassuring"
"We would certainly recommend you to our friends......"
"Felt you knew your market well – attentive, enthusiastic, even in a difficult market." Through our membership with The Guild and our associate office at 121 Park Lane, Mayfair we hold bi-annual exhibition at our prestigious Park Lane national property centre. Click the button below for more information.